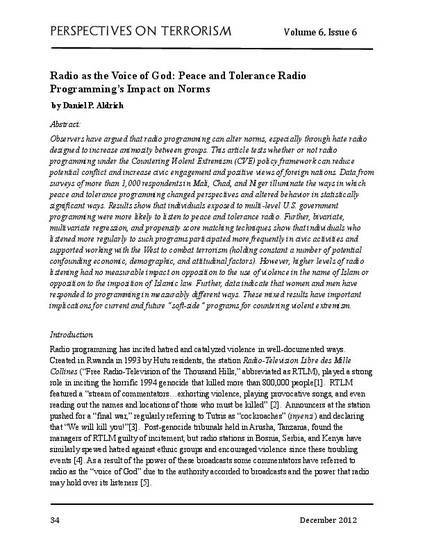 Observers have argued that radio programming can alter norms, especially through hate radio designed to increase animosity between groups. This article tests whether or not radio programming under the countering violent extremism (CVE) policy framework can reduce potential conflict and increase civic engagement and positive views of foreign nations. Data from surveys of more than 1,000 respondents in Mali, Chad, and Niger illuminate the ways in which peace and tolerance programming changed perspectives and altered behavior in statistically significant ways. Results show that individuals exposed to multi-level U.S. government programming were more likely to listen to peace and tolerance radio. Further, bivariate, multivariate regression, and propensity score matching techniques show that individuals who listened more regularly to such programs participated more frequently in civic activities and supported working with the West to combat terrorism (holding constant a number of potential confounding economic, demographic, and attitudinal factors). However, higher levels of radio listening had no measurable impact on opposition to the use of violence in the name of Islam or opposition to the imposition of Islamic law. Further, data indicate that women and men have responded to programming in measurably different ways. These mixed results have important implications for current and future “soft-side” programs for countering violent extremism.